hmmmm. i coultd run my backmon locomotive with a lense decoder with my dijitrucks on latus track. i may have to install katy couplers. but i think i will stay away from the leaf-lick and kay-tell stuff though.......my bowwowser cars do fine. i think i will model onion pacific or sani flush, or maybe cheesy system. http://www.loebglebeonline.com/Merchant2/graphics/00000001/DSC01057.jpg What are you trying to do? industrial?! Neat lettering on the loco. ah yes. guilford. home of the disposable locomotive. is that one from spring a leak terminal, botox & marine, or marine control? 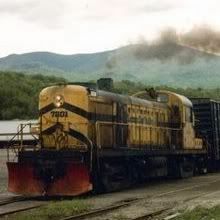 Its an ex N&W GP35. For those who don't know, Pan Am Railways/Guilford Rail System own Boston & Maine, Maine Central, and Springfield Terminal. Each own track and locomotives. Timmy Mellon started Guilford Transportation Industries, when he came in control of both B&M and MEC. Soon after, he bought ST which was then about a mile long. ST was originally an electric (street) railroad with ties to the B&M. Timmy began transferring employees from B&M/MEC payrolls to ST, because ST union contracts were more in favor of the railroad. This caused crippling strikes in the 80s which resulted in a loss of many customers. in 2006 Guilford Rail System changed their name to Pan Am Railways because of Timmy's plane fetish, and the fact that it was a more recognizable name. nice smoke show ! Poor engine, it looks like it had some coughs in it. Got a good chuckle out of the lettering on the side of the locomotive on fire. With the one door partly open, it reads "Guilford Fail System." Theres actually several Guilford Fail Systems locomotive kicking around. Someone has scraped off part of the R. You should see the bells on that railroad. I won't go into as much detail, but one employee has quite a bit of paint. Let's see, how about doing panoramic pictures? It's not a product, but I saw a picture of a Southern gon lettered "Suothern"